Just in time for Thanksgiving! Pommes boulangère means “potatoes from the baker” and dates back hundreds of years, when most rural French households lacked their own oven. On Sundays, when everyone went to church, women would carry a dish with sliced potatoes and onions, along with a roast of lamb, and put it in the baker’s oven, where it would cook while the family was at mass. After church, they would come by and pick up the food—hot and completely cooked—and carry it home for a Sunday lunch. I rarely have any of these potatoes left over after a meal, but in the rare instance that it happens, I like to heat up the leftovers with some grated Gruyère and top it off with a fried egg. Check out the video below, I did with my director of communications, Emily and let us know what you think! In a large saucepan, heat enough oil to cover the bottom of the pan over medium heat until the oil is shimmering. Add the onions; reduce the heat to medium-low, and cook, stirring from time to time, until the onions are caramelized, 35 to 40 minutes. Season with salt and pepper to taste. Preheat the oven to 375°F; position the rack in the middle of the oven. Butter the inside of a 2-quart baking dish with the butter. In a small saucepan, heat the stock over medium heat until hot. 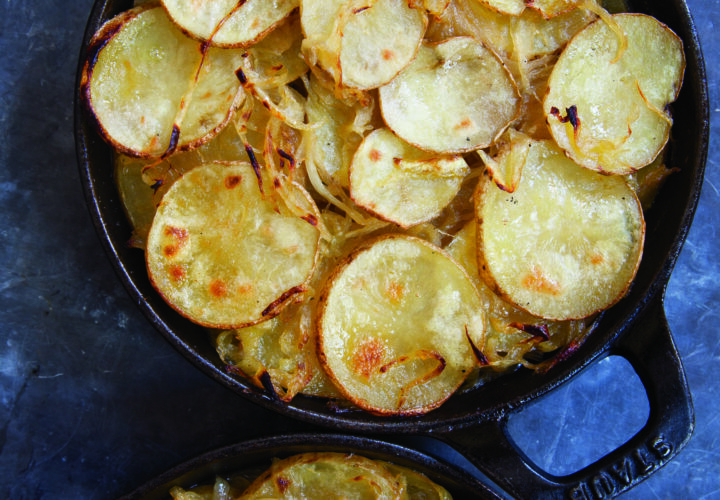 Place a layer of potatoes over the bottom of the prepared baking dish, followed by a layer of caramelized onions. Season lightly with salt and pepper. Repeat this process until you run out of potatoes, making sure that the last layer is potato. Pour the hot stock over the potatoes, cover the baking dish with foil, and bake for 40 to 50 minutes, or until the potatoes are cooked through. Remove the foil and bake for 10 minutes more, or until the top layer of potatoes is crispy. Serve immediately.